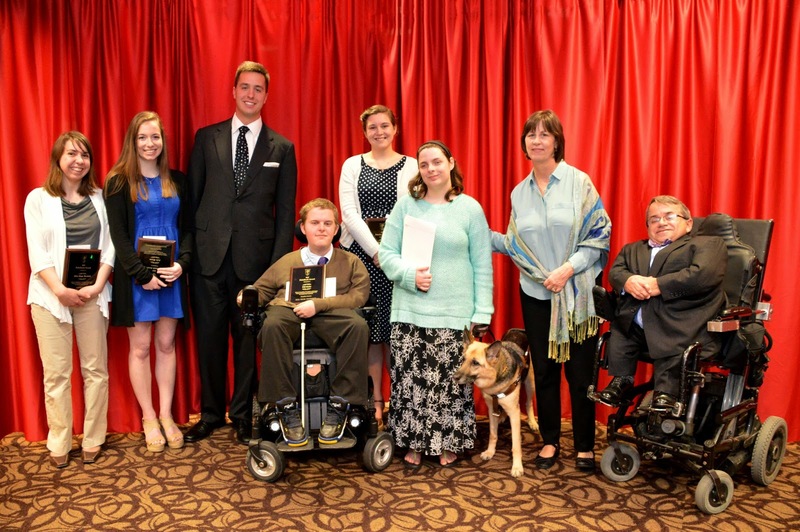 On Tuesday, April 7th, Ball State University held its Disability Services Annual Awards program. Mary Beth and I presented the 2015 Fehribach Awards to students who have maintained high academic standards while being involved in the Ball State community outside of the classroom. Ball State is committed to challenging students with disabilities to enhance their careers and elevate their futures. As a Distinguished Fellow of the Political Science Department’s Bowen Center, I stress to students the importance of political participation. One of the Bowen Center’s key focuses, political participation by a disenfranchised group will help Indiana grow. Elise Basiletti, a senior Special Education major, is a student with an incredible array of extracurricular activities. While maintaining a 3.8 GPA, Elise has been involved with the Chi Alpha Phi Christian Fellowship, the American Sign Language Club, and volunteers for classroom panels and presentations. Elise also works at two Chick-Fil-A restaurants, and was involved in the Indiana School for the Deaf residential program last year. Julie Bloom is a senior Elementary Education/Special Education major. She has over a 3.0 GPA. Julie has been a four year member of St.A.R.T., Student Alumni Relations Team, and a four year participant in Ball State’s Dance Marathon. She is a member of Kappa Delta sorority, where she held multiple leadership positions. Julie worked in the Course Exemplar Poem Project in the spring of 2014 and volunteers her time with the Muncie Animal Shelter, the Buley Center, and Beyond I Can. Derrick Decker, a senior Athletic Training major, has been a part of Ball State’s Athletic Training Program and Athletic Training Club. Derrick has a 3.1 GPA and is a member of Sigma Chi fraternity. He worked with BSU’s men’s basketball, football, and women’s volleyball and softball teams, as well as working at several local high schools. Derrick also worked at the Henry County Sports Medicine/Performance Enhancement and interned with the Indianapolis Colts in the summer of 2014. Malia Finch, a senior Legal Studies major, holds a 3.6 GPA. She has worked in many roles across campus, including in Housing and Residence Life, as a Resident Assistant (RA), a Multicultural Advisor (MA), and a co-teacher of EDHI 200. She was a teaching assistant of POLS 474 and POLS 130, and was involved in peer tutoring. Malia is a member of the Legal Studies Student Association and volunteers at Longfellow Elementary School, as well as working as a Peer Victim Advocate at the Office of Victims Services. Will Kuhn is a senior Telecommunications major who holds a 2.8 GPA. Will is the Athletics Chair of Phi Gamma Delta and a member of Ball State’s Power Soccer team. Will is also a member of the Fundraising and Technology Committees of Dance Marathon. He interned at Eskenazi Health Hospital in 2014, and has been integral in helping that program grow. Along with his other accomplishments, Will serves as a Student Trustee Selection Committee member. Amanda Rusk, a senior Criminal Justice major, works in the Adaptive Computer Technology Lab. Along with her work, Amanda holds a 3.5 GPA. She is a member of the University Conduct Board, and studied abroad in England for a year. In the spring 2015 semester, Amanda interned at the Delaware County Adult Probation. As President Ferguson joined his voice with others calling for “a vibrant and diverse community”, he and other university presidents were of the few leaders who included people with disabilities in their public comments. By ensuring access for all Hoosiers, Ball State continues to be a forerunner for economic equality. We expect these students to be the next generation of leaders who will take on the responsibility for accessible and inclusive public policy.